In line with other recent Samsung handsets, the S8000 Jet has two different picture galleries. They are both optimized for touch operation and very user-friendly, plus this time each sports a cool new view mode. The first gallery is an inherent part of the file manager and accessing it is as simple as opening any folder that contains images. It allows sorting your images by date, type, name, and size. The gallery offers grid, list and a nicely looking zig-zag view layouts. The latter is definitely the most visually elaborate but also certainly the least functional as it needs quite a lot of scrolling in some folders. Going through photos is quite fast with the Jet, we're delighted with image browsing speed. Once you open an individual image, you can sweep you fingers across the screen to see the next images without having to return to the image list. Alternating portrait and landscape modes is automatic thanks to the built-in accelerometer. Samsung have also implemented the so-called one-finger zooming, which is recently getting new press hype by Samsung. It's marketed as a novel feature, but it's been around for quite some time already on the original Samsung i900 Omnia. And we just saw it implemented on the Pixon12. Zooming is extra simple and takes only a single move of your thumb - you just need to hold it on the screen for a second and then drag up or down for zooming in or out. This method works in both galleries (as well as the web browser) and at first glance it even seems more convenient than the pinching gesture on the iPhone. The alternative to the picture gallery is the Photo browser. Strangely, the Media browser that we found on the Pixon12 wasn't present here and we really liked it a lot more. At least the images are ordered chronologically by default unlike the previous versions of the app we have seen. You can also opt for some other filters such as the usual "by file name" or the more intriguing "by color". As usual the two galleries also have another Samsung proprietary accelerometer-based feature. It lets you browse pictures in fullscreen landscape mode by simply tilting your phone up and down. The sensitivity of the tilt scrolling has been improved to a point that it is acceptable and quite usable. It is a great improvement over the rather annoying implementation in previous handsets that we have tested. But still, that feature is more of a gimmick and among the less practical things we've seen in the image gallery ever since it was first introduced on the original Pixon. The music player usually found on Samsung devices has received a light refresh on the S8000 Jet. It sports slightly different icons when browsing your tracks and a new way of displaying album art in Now Playing mode. The music player allows filtering tracks by author, album, and genre. Automatic playlists (recently added, most played etc.) are also generated and can subsequently be used as filters. If that doesn't seem enough, you can create your own custom playlists. The music player can naturally be minimized to play in the background. The new option here is the '5.1 ch' button which, when activated, makes the player do its best to emulate 5.1 channel sound on normal stereo headphones. 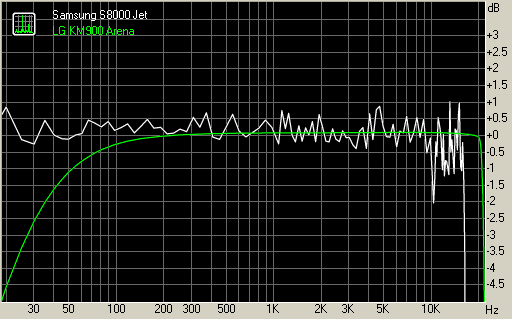 There are quite a few equalizer presets available, but no option to set up a custom equalizer. Further on, the three different visualizations are a nice touch to the music player and the album browser (quite like the one on Omnia HD) takes after Apple's Cover Flow, something we quite appreciate. The music player widget is cool, allowing quick access to the full version of the application by only a single tap. You can also start, stop and skip tracks straight on the home screen if you prefer. The Samsung S8000 Jet features an FM radio with RDS. The advanced RDS allows displaying the station name on one row and some additional info on the other. It is complemented by a user-friendly and easily thumbable interface with several large buttons appearing on screen. The Jet can automatically search and save all the available stations in your area. Alternative frequencies of a given station are automatically detected too, so you don't have to retune manually when traveling. There's an option to record radio broadcasts as well. The Samsung S8000 radio comes complete with an integrated music recognition feature called Find Music, which works much like Sony Ericsson's TrackID. If you won't bother hitting the menu, the Radio widget on the homescreen gives you more immediate access. Tapping on it brings up the radio or you could just use the widget's controls to start/stop the radio or change the station. It can only jump saved stations though, and if you want to search you'll have to do it in the application. Speaking of stations, you can save stations but they are labeled by just their frequency and can't be renamed. There's a separate list for your favorite stations. The video player has a nice touch-optimized interface and all the essentials are covered. It can play video files in fullscreen landscape mode (auto-rotated of course) and you can fast-forward and rewind videos in the same way as the music player. The video player even provides the same 5.1 channel option when you plug in a headset. It also allows direct uploading of a video on the web. The Samsung S8000 Jet has no problem playing VGA or even 720x480 videos at 30 fps. Not a great surprise but worth noting since compressing videos to view on mobile devices can be a time-consuming business. One of the best parts about the Samsung S8000 Jet video player is its DivX and XviD support. This means you no longer need to convert your videos to play them on your handset - just get them onboard and you are good to go. The audio quality of Samsung S8000 Jet is pretty decent. The only concern we are having about its audio reproduction capabilities is about its somewhat shaky frequency response. It tends to deviate from the perfect for large parts of the audible range. The rest of the scores however are excellent. Both the noise level and the dynamic range of the Jet can easily rival dedicated music player, and so can the stereo crosstalk. We have no grudges against the distortion levels either. Here go the results so you can see for yourselves how the Jet compares to its competition. Things seem pretty equal between it and the LG KM900 Arena, with the LG winnig by the slightest of margins.